Sixty poems, by our most acclaimed and beloved poets, for the difficult times we live in. In this sequel to the Beacon bestseller Poems to Live By in Uncertain Times, editor Joan Murray has once again gathered an astonishing group of poems that speak to our personal and shared concerns in a troubled time. 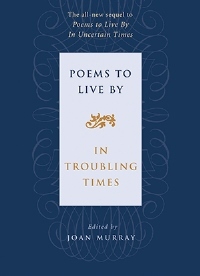 Poems to Live By in Troubling Times features works carefully selected and deftly organized to help guide us through the complexities of our current situation. Included are poems that speak to our anxiety and terror; rally our hope and courage; warn us of complacency and complicity; stir us to action and compassion; lead us to question our leaders and politicians; move us to meditation and prayer; urge us to confront war and violence; and give us hope for peace and justice. Readers will find wisdom to sustain them as they face difficulties in their individual lives or confront our common contemporary predicament. These are not poems that provide easy answers or overheated rhetoric but poems that speak directly and deeply to the soul, from the most important and celebrated poets of our era.